Extensive travels across central Asia have taken me up the plateaus of Tibet, across the meandering middle of China, around the mountains of Nepal, and along India's littered river banks. Although each has had the power to captivate, India, without a doubt, is the most beguiling land I have ever seen. From India I journeyed North, into Kashmir-- a land of wealth and beauty, shredded by the claws of covetous neighbors. A Kashmiri Mohammedan said to me, "God keeps men in three jars. Do you understand?" "Yes," I answered, "you say God keeps men in three jars." "In the first jar," the man looked at me, "God keeps the Americans. God keeps that lid very, very tight, for the Americans try their level-best (he used Indian phrases) to escape and rule the world." I nodded, hinting a smile, saying, "God is right." The Mohammedan smiled back, holding up a hand to quiet me, and continued, "In the second jar, God keeps the Europeans. But God does not keep that lid so tight," still holding up his hand, as if expecting interruption, "You see, God knows the Europeans also want to rule the world, but Europeans do not try hard." "Is true, is true," I chuckled. But, like a preacher, the man held his hand even higher, and continued on with a louder voice, "God keeps Kashmiris in the third jar, but God does not keep a lid on our jar. We also want to rule the world but every time one of us tries to escape, the rest pull him back down!" and he clenched his fist! "Sir," my smiled faded, "It would be difficult to convey more truth with fewer words." In post-Saddam Iraq, another lid is off. But with so many people grabbing at the ankles of who ever makes a leap for the top, freedom to communicate has not changed the situation dramatically. On mobile phones, in internet cafes, in marketplaces and mosques, journalists and citizens alike know that what they say can kill them. A blood-spattered witness to Mosul's call to prayer (arms?) might argue that who controls words, controls man. The Mosul police are now strong enough to launch successful undercover operations, and have been fanning out across Mosul and surrounding villages, snooping and listening for snippets. On July 15th, police working undercover in a village Northwest of Mosul heard a group of villagers talking about a weapons cache, but the location was not mentioned. Iraqi forces locked down the village, searched and found a weapons depot from Syria into Mosul. Iraqi police also found and rescued the 28 year-old woman I mentioned briefly in the last dispatch. She was the wife of a Mosul journalist, and had been kidnapped and held for ransom by members of a beheading cell. After the village search, police hauled four men to a Mosul station for interrogation, and alerted the Americans. Soldiers from A Company, 1-24th Infantry Regiment, headed to the police station to find out what the cops were learning, and I asked LT David Beaudoin, who was leading the patrol, if I could tag along. I had first met Beaudoin some months ago after a car bombing that claimed some of our people. Since that time, I had come to know Beaudoin as quiet, always polite, and well-liked by the soldiers. It was Beaudoin's mannered countenance that everyone saw as we arrived and sat down in a police colonel's office. The colonel was engaged in conversation with the Iraqi journalist, the husband of the 28 year-old woman who had been released. As details of the kidnapping emerged, the surface of the big picture rippled with a winding current of revision. The kidnappers had threatened to cut off his wife's head, the journalist explained, kill him, and the rest of his family. But they would take $45,000 in exchange for "civility." Evidently, the journalist had not been targeted for exercizing the power of the press; it was the promise of precedent that attended this abduction. Only months earlier, four men kidnapped the journalist's brother-in-law and demanded ransom of $50,000. The family negotiated the fee down to $5,000. A deal was struck, the money paid, and the "civility" delivered. Now, apparently, the same four kidnappers were back for the balance: $45,000. But the Iraqi undercover police, listening to people talking in a marketplace, picked up the trail that led to the rescue, and their eavesdropping also unleashed a cascade of avalanching proportions. While the four kidnappers were being interrogated somewhere on the grounds, the bespectacled journalist--genuinely thankful for the release of his wife--was appealing to the colonel to hold the men. He said that other terrorists were still threatening to kill both he and his wife, and that if the men were released, his family would be killed. Without saying as much, the journalist indicated that he wanted bad things to happen to bad men. I had seen recent information about plans to assassinate a journalist--Deuce Four leaders thought I might be the target. But now, hearing this journalist talk, I thought he must have been the target. LT Beaudoin's face yielded no hint of his reaction to the news from the journalist. I pulled a notepad from my pocket, scratched a note and handed it to Lt Beaudoin. He read the scribble-- There was a SIGACT that AIF plans to assassinate a journalist with an IED-- glanced at me with affirmation, then continued asking questions of the journalist through the Army interpreter. But hell, I thought, looking at the journalist, You paid five-thousand bucks for your brother-in-law. Of course the kidnappers are coming back. The kidnappers know him as a client. Next to his name on their list, someone must have written "Has money, will pay." And pay. And pay. His jar is open. Perhaps fueling his distress was the well-known but little mentioned tendency--some might say emerging trend--for some Iraqi police to release prisoners for bribes. This catch and release program has the same negative consequences as the Coalition tendency of detaining and then releasing suspected insurgents following a brief incarceration at Abu Ghraib. I have heard American military officers and senior enlisted men around Iraq complaining that terrorists are being released back on the streets, where their own soldiers and Marines must face them yet again in combat. Every combat soldier knows the risks of capturing dangerous men far exceed those associated with just killing them. Capturing a terrorist is no longer a signal of the end of his ability to disrupt forward progress. That's not a minor shift in emphasis. Among people weary of watching friends and comrades fall and bleed to death, any adjustments in the goal posts give rise to discussions of more expedient and durable ways of dealing with infestations of combatants who scurry in and out of hiding places. Not tightening the lids on these insect jars does more than just lead some cantankerous officers and police to consider more definitive measures of dealing with combatants. It also places our young soldiers and Marines in precarious waters, where one can only hope they are physically and morally conditioned to resist the current. Some of those same currents had started swirling around the colonel's office, as LT Beaudoin asked increasingly specific questions that were deflected and re-directed if not evaded outright. Young LT Beaudoin dove for the diplomatic throat, raised his voice a notch and said firmly to the police colonel, "Listen! You need to be straight with us. We are your allies. We will capture or kill these guys." Before the interpreter could translate Beaudoin's words, it was clear their meaning had been communicated. 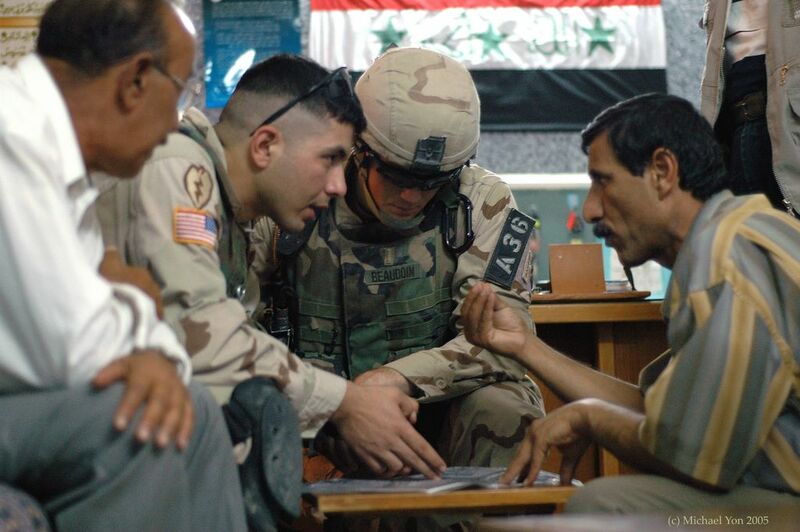 The Iraqi journalist and the police colonel both were in my field of view. They sat upright and paid full attention to Beaudoin, promising to provide the information requested. But LT Beaudoin was not satisfied, and said, "I want to interview the police lieutenant who captured these guys," which everyone knew translated to, "Get the lieutenant who captured them in here, now." The colonel spoke and waved his hand, and soon a policeman came into the room. He flattened a laminated map on a tea table, and the journalist and the police chief started pointing possible targets to LT Beaudoin. The momentum of the meeting had shifted from friendly and informative, to specific and deadly. There is a pattern of cascades in counterguerrilla combat operations. In this kind of warfare, information drives maneuvers, and a single capture of a key person frequently cascades into a shower of raids and captures, each pregnant with the next storm. That night, Iraqi police took the 4 captured men out to identify targets. On route, one "tried to escape" and was killed, intensifying the pressure on the remaining three. The cascade had begun with the snippet of information, but now was fanning open, as police, operating alone, uncovered the original cache in the village northwest of Mosul. While this catch was merely a depot to Mosul, it led to the giant cache we raided ["The Devil's Foyer," 21 July 05], and from there to yet another large cache uncovered on the same day on the east side of the Tigris River in Mosul. The cascade fizzled to the end of its run at a fourth cache that rendered only empty munitions containers. Of greater interest was the prisoners' admission that the munitions were being readied for the next elections. Many of the "fighters" here emerged and filled the vacuum following the fall of Saddam. In Tombstone, they'd be guns for hire; in Bogota, they'd be kidnappers without a cause. Here, they do not equate so much to organized resistance as to organized crime. They get lumped in with the "resistance," but this is not entirely accurate. They do business with it, and they exploit it for personal gains like money, possessions and power. Today, the terrorists and their more populous criminal cousins in Iraq have a great deal in common, including the goal of forcing the new government to fail in its mission to secure the borders and restore and maintain order. The terrorists have been trying to--with good success--cripple the macro-economy by destroying pipelines and infrastructure, and these attacks help the criminals. Attacks on gas stations, for instance, disaffect the citizenry from the government, while giving black-marketers transient fuel monopolies. There's good money to be made in chaos. Last week, Deuce Four soldiers visited gas stations that had been vandalized, including one station which came under sniper attack just before we arrived. When we walked into that station, a cop came forward, eager to brag about how he had just killed the sniper. Other police officers gathered around, smiling and sticking close to the day's hero, sharing his status as flavor-of-the-day. All the while, a seemingly endless line of Iraqi cars idled in the hot sun. Gasoline shortages in this oil-rich nation force tens of thousands of Iraqis to sqaunder whole days of their lives, waiting to fill their tanks. The many taxis in line all have their trunk lids removed, to show they are not carrying large car bombs. Still, of all the clawing hands weighting the legs of the new Iraq, the foreign "jihadists" get the least respect and are mostly despised. Local terrorists, even those who trade in newly-minted matyrs, seem to view jihadists as the lowest of the low-- as if the volunteers-come-hither are merely fungible foreign idiots, worth less than the wads of floppy third-world currencies crumpled in their pockets. The foreign fighters are a sort of toxic waste drifting and floating on the surface of this civil war. Their touch is stain. And so it was for one foreign fighter some days ago. Mosul police were driving downtown when a fusilade of machine gun fire penetrated their truck. The guns began to cool, having shot seven policemen dead. Nearby, a Deuce Four combat patrol came upon three suspicious cars driving erratically. The first car sped away, but the second car--a taxi--was not so lucky, because the driver of the third car apparently panicked and smashed headlong into the rear of taxi. The taxi driver bolted from his car. There were three passengers in the third car, now accordianed into the back end of the taxi. The front seat passenger tested the mathematics describing physics, stopping his inertia by smashing his head into the windshield, leaving a complete impression of his Tunisian face. As the Americans stopped and dropped ramps, all three passengers bolted. They ran to the right, leaving a trail of tossed weapons on the road that included two AKs, a grenade and a pistol, and two RPGs and four RPG rounds in their car. The Americans, SSG Freed, Tuzza, and Specialists Hood, Reynolds, Holden, Chacon and others, all led by LT Dave Webb, got after the terrorists. SSG Freed followed the trail of glistening blood-drops from the crash scene for three blocks into a house until he came face to lacerated face with the Tunisian, tackling him as he climbed the back wall of a house. Meanwhile, the taxi driver had taken refuge in a store behind a counter, and when an American soldier came 'round, the owner subtly signaled with his eyes that a terrorist was hiding behind his counter. Busted. The soldiers came under small arms fire, perhaps from the car that escaped, but held tight and rounded up four fighters. The Tunisian got busy telling everything he knew. Such is the burden of foreign fighters on the Iraqi terror networks. When caught, they normally tell everything as fast as they can, unleashing cascading rapids of details about insurgent plans, people and resources. Next day, I was sitting in the TOC when intelligence arrived that a top Mosul terrorist was in a certain location nearby. It so happened that LT Orande Roy Sr, along with his Deuce Four Stryker platoon, was also nearby. Minutes later, LT Roy rolled up on a dozen Iraqi men. The soldiers began to detain and separate the men when they spied one man slowly reaching into his pocket and wrestled him down. Specialists Joseph Vanvranken and Darrell Blanchard searched him and found a hand grenade and pistol in his pocket. As the weapons were revealed, the other Iraqis, as if on cue, started pointing to the man with the grenade and the pistol saying he was a bad guy, or perhaps the bad guy. In the excitement, a baby boy began crying. The man holding the boy was having little success in comforting him, so another man looked concerned for the child and asked to hold him. Of all the men there, LT Roy said, the man who reached for the child seemed the calmest, safest and friendliest. About that time, one of the younger American soldiers walked out to LT Roy holding at arm's length a vest filled with explosives--luckily, his handling had not detonated the device. LT Roy decided to detain everyone, and as one soldier reached for the child, the friendly man started to shudder, his calm facade faltering. Adding to the mix, the interpreter noticed that one of the men had a foreign accent. He was Libyan. The Libyan, like so many "jihadists" who come to Iraq itching for action in the holy war, found himself treated as exspendable bomb casing. He started confessing everything. In fact, he had no sooner sat down at the table in the detention facility here on base than he had filled three pages with detailed handwritten confessions. The Libyan had crossed the border from Syria into Iraq on foot, intent on fighting a holy war, as an infantryman engaged in direct combat with American soldiers. He did not want to be a martyr, merely a jihadist. He did not want to die in Iraq. His Iraqis "hosts" had threatened to kill him if he refused to wear and detonate the explosive vest while mingling into a crowd of Iraqi police. But the Libyan did not like that plan and was angry at the Iraqis who were trying to force a holy jihadist to become an unwilling bomb, and he was telling everything. Another cascade. And the calm man, who appeared so clever and confident while standing there comforting a crying infant? How the picture changed when a young American solider stepped into the frame, reached for and gently took the child. Without his prop, the actor faltered, his illusion cracked and shattered as he shuddered before the soldier. This man who cowered behind a crying child was one of the top terrorist leaders in Mosul. I remember the Kashmiri Mohammedan and his three jars. While terrorists on earth do their best to keep us down, men and women boarded a space ship in Florida today, and flew into space.